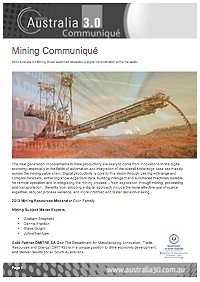 The next generation improvements in mine productivity are likely to come from innovations in the digital economy, especially in the fields of automation and integration of the overall knowledge base seamlessly across the mining value chain. Digital productivity is core to this vision through dealing with large and complex data sets, extracting knowledge from data, building intelligent and automated machines suitable for remote operation and in integrating the mining process — from exploration through mining, processing and transportation. Benefits from adopting a digital approach include the more effective use of scarce expertise, reduced process variance, and more informed and faster decision-making. To respond to ever-increasing challenges and to achieve a step change in performance, mining companies have been experimenting with new business models and new technologies to reinvent the way operational processes are carried out. The business value of rapid organisational adaptation has been demonstrated by the dramatic economic cycles in mining over the last decade. In that time the use of Information and Communications Technology (ICT) has become increasingly fundamental to business operations. ICT linked with new sensor and production technologies are now critical factors in both business productivity and business agility through the more effective use of scarce expertise, improved data and information analysis, reduced process variance, and more informed and faster decision-making. All major mining companies are conducting significant initiatives that take advantage of new technologies, and there is an opportunity for Australia to be at the forefront of developing the ICT solutions that will play a fundamental role in this industry transformation in productivity. 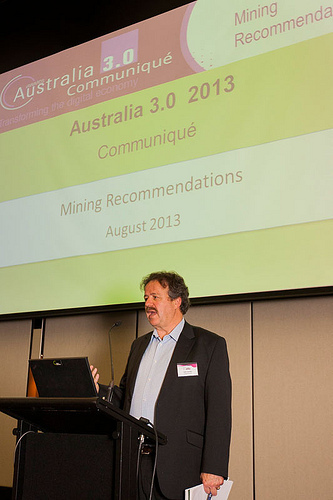 Government has an important role in setting up the initial conditions for a flourishing SME market in Mining Equipment, Technology and Services (METS), including developing an agile and innovative ICT sector, and in attracting to Australia investment and expertise from the global mining industry, including product and services companies. We recommend that an inventory of industry activities be compiled and made available on-line so that mining companies, research organisations, suppliers and government can better coordinate their individual efforts and not have to reinvent every component of the change. value of benefits achieved from the adoption of technology driven innovation. We recommend that Government seed the facilitation of an Industry, Research and Government Forum that takes an active role in progressing joint “industry owned” initiatives to develop innovative technologies and processes. We recommend Industry, Government, Research and other players come together with appropriate resources to resolve technology regulation and standards issues hampering technology adoption in Mining. This will be most effectively achieved with seed facilitation by government, with ongoing funding and operation provided from Industry through the ICT Innovation in Mining Forum proposed in Recommendation 2. Such collaboration in other industries has demonstrated the productivity gains that are achievable as a result of coordinated industry-wide initiatives, including the encouragement of an active SME market for niche solutions. We recommend that Industry, Government, Research and the relevant tertiary training institutions come together to plan and assure the availability of appropriate skills required for the future health of the Mining Industry. This will be most effectively achieved with seed facilitation by government, with funding and ongoing operation provided from Industry via existing mining and ICT industry associations. a) Building relevant ICT literacy skills into the training of future Mining specialist and leadership positions (Geologists, Engineers, Managers, etc). c) Developing industry strategies for keeping key experience within the industry. Eg: applying skills to cross-industry research, innovation and knowledge base building initiatives. d) Addressing challenges presented by the retirement of the baby boomer generation and consequential loss of knowledge and experience, as well as the opportunities presented by encouraging industry participation from a more technology-savvy generation. Developing a coordinated strategy will be help build and maintain future relevant skills well as retain industry knowledge through the peaks and troughs of the mining cycle.